Penstemon cobaea is a great addition to the perennial border. I love the architecture of the stamens inside the throat of the fower in Penstemons. 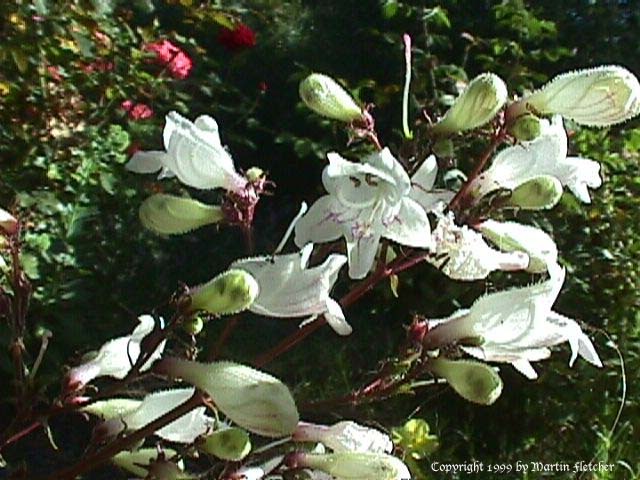 The white flowered Penstemon cobaea has just a hint of purple at the base of the flower and in the anthers. Penstemon cobaea blooms in the spring and early summer. Penstemon cobaea prefers light shade and a bit of water when planted near the coast, more shade if planted inland. The dark green leaves are all at the base of the plant. The flower stalks come up to about 18 inches. This plant is very similar to the Penstemon digitalis cultivar 'Huskers Red' except that the latter has red leaves. Penstemon cobaea is a potential larval food source for the Common Buckeye Butterfly and could be a nice addition to your butterfly garden. White flowers with purple markings - Penstemon cobaea - Prarie Beardtongue, Foxglove Penstemon.